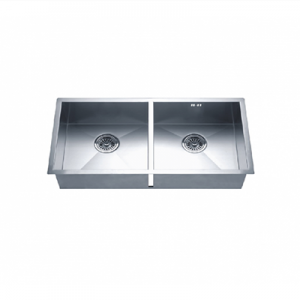 The CAE KN2015-1 Double Bowl Undermount Stainless Steel Kitchen Sink is both stylish and convenient. Keep your kitchen clean and organized with this double bowl kitchen sink. This kitchen sink is finished with stainless steel for a classic look. Made by CAE, this stainless steel double sink was designed to last. The kitchen is the heart of the home, and you need it to be both stylish and functional. No other kitchen sink fits the bill quite as well as this undermount sink from CAE. This large sink gives you plenty of room to work in your kitchen, and its double-bowl design makes it easy for you to keep your kitchen clean and organized. Whether you’re cooking dinner or doing the dishes, there’s no better sink for a variety of needs than this stainless steel double sink from Fiberpol.